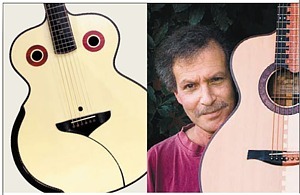 Left: Howard Klepper�s unique Nakyd Laydie guitar. Right: The luthier with his Dovetail Madness model. Take a quick glance at some of Howard Klepper�s immaculately built guitars and you�ll see the work of a master craftsman devoted to the art of the guitar�with a variety of exotic and gorgeous tonewoods, unique handcrafted rosettes and bindings, and even a sly sense of the outrageous (as in his Dovetail Madness guitar). Look further, and you�ll find that Klepper is just as consumed with the science of lutherie, creating new bracing systems and body shapes and modifying numerous structural elements to strengthen his instruments and refine their sound. Klepper�s designs use new and borrowed elements that, added together, illustrate his sense of how the parts affect the whole of the guitar. For example, he has developed a topbracing system that he calls �Klepper bracing,� which was a result of doming the tops of his flattops. �The traditional way of making a flattop guitar was exactly flat,� he explains. �But more recently, builders have started to dome their tops to a spherical shape, which gives them more stiffness, more strength, and the ability to withstand humidity changes, and also shifts the tonal pitch of the top upward a little bit. On his 12-fret guitars, Klepper uses a graceful double cutaway that he calls a �recurve (see page 77).� �It�s an historical allusion to the viol family,� he says, �but it�s functional as well. The 12-fret neck joint with the double recurve allows access that�s pretty comparable to a 14-fret guitar. It also adds some rigidity to the upper bout. One of the things I try to achieve in a few different ways is to stiffen the junction of the neck to the upper bout in a way that will delay and possibly prevent the need for neck resets. The recurve helps to stiffen that area.� Klepper also puts a heel on the neck block (in the Spanish style) and runs carbon-fiber struts from the top of the neck block down to the lower bout below the waist, sending some of the compressive force of the strings down into the lower bout of the guitar. Sound, style, form, and function are clearly of equal interest to Klepper, who has recently moved his shop to Santa Rosa, California. You can hear and see his work there or at a number of upcoming lutherie shows, or check out his extensive website for more information on this evolving artist.